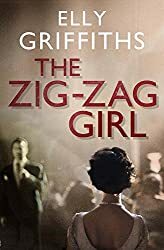 My choice this week is: The Zig Zag Girl by Elly Griffiths, a book I have just finished reading. I must not be sick, thought Edgar Stephens. That’s what he wants. Stay calm and professional at all times. You’re the policeman, after all. I did. I’m a squeamish reader and don’t like anything too graphically gory and you might think this opening would put me off. But it didn’t – for one thing, it doesn’t go into detail about how the body got cut into three. Well, yes later down the page there’s mention of ‘clotted blood and smell of decaying flesh‘, but that’s it, it’s all secondhand, no scenes where the murderer is described doing the terrible act, no dwelling on what he/she was doing to the other person. Brighton, 1950 – a post-war world of rationing, austerity, pea-souper fogs and seedy seaside resorts. When the body of a girl is found, cut into three, DI Edgar Stephens recalls a magic trick that he saw as a boy. The illusion is called the Zig Zag Girl and its inventor, Max Mephisto, is an old friend of his. They served together in the war as part of a shadowy unit called the Magic Men, formed to use stage trickery to confuse the enemy. Edgar tracks down Max and asks for his help. Max is still on the circuit, touring seaside towns in the company of ventriloquists, sword-swallowers and dancing girls. Max is reluctant to get involved but the changes his mind when the dead girl turns out to be his former stage assistant. Another death follows, again gruesomely staged to resemble a magic trick, the Sword Cabinet. Edgar and Max become convinced that the answer to the murders lies back in their army days and the antics of the Magic Men. When Edgar receives a letter warning of another ‘trick’, he knows that they are all in danger. The Wolf Trap is the deadliest illusion of all, but who will be the next victim? I’ve read some of Elly Griffiths’ Ruth Galloway, forensic archaeologist, crime novels, which I have enjoyed despite wishing they weren’t written in the present tense. So it was with relief that I came to The Zig Zag Girl and found it’s written in the past tense. I enjoyed it in several ways – for its characters, particularly Edgar Stephens and its setting, recalling the atmosphere of the 1950s and how times were changing. The theatrical elements are fascinating – life on the variety circuit was not all glitz and glamour; and the activities of the Magic Men unit during the war had of course an immense effect on all their lives. I worked out quite early on who the murderer was – but not why, which only dawned on me at the end of the book. I don’t know if this is going to be the start of a new series – I’d read more if it is. I really enjoyed this book, a departure for the author from the Ruth Galloway series, and you’re right she manages to stay away from gratuitous depictions of the murder. I prefer books in past tense as well, it just reads nicer! This sounds like it could be interesting, I love magic! I can do with a bit of gore but there has to be a point to it, don’t just describe a corpse to me if the details aren’t going to help me figure out who the murderer is! Thanks for sharing 🙂 I hope you have a great week! Yes, I would read on! And shall be keeping a close eye out for this as I love Elly Griffiths’ writing. It definitely makes me want to read more. Thanks for joining us. That intro pushes me away, but I’m glad you liked it. Think I’ll add this one to my TBR list. Thanks for sharing it. I love the cover of this book, but I don’t think the book is for me. Although I love a good crime novel, this one isn’t grabbing me. I’d need to read a few pages more. I’m glad you enjoyed it. I suppose all policemen have to pull themselves together again after viewing a corpse. I liked your intro. Glad you enjoyed the book. I’d definitely read more. I love Elly Griffiths’ Ruth Galloway series and was interested in seeing that she had branched out. It won’t be published here in the US until the fall. I’m looking forward to it! loved her Ruth Galloway series. thank you for showing me, another book by this author.